Focus on doing business the right way: By leading, creating, and making a difference. Enroll in one of the top-ranked MBA programs in the U.S. where we mold leaders, creators and disruptors. Our faculty not only teach but mentor. You’ll grow to inspire others, be strategic, and work with integrity. Gain the right mix of quantitative and qualitative skills. Through practical learning, you’ll become a business expert. With our personalized leadership development, you'll advance past any plateaus. The Professional MBA program is a part-time 21 month MBA program with classes meeting primarily one night per week. This makes the program a perfect fit for the full time working professional. The program is also available in a 16 month format with classes also beginning in August. This program’s cohort model means that during your two years of study, you’ll have a support system. Students with diverse skills and backgrounds will join you. And you'll find common interests and form invaluable relationships with classmates and mentors. Learn how to build companies that engage, grow and support collaborators and visionaries. You'll have the opportunity to opt in to our leadership development program where you'll learn more about your strengths and weaknesses, meet with a career coach regularly and gain a C-suite mentor. Our graduates are influencing the business world for good, at home and overseas. You too can make a difference. What do the most effective professionals do well? What do employers expect from MBA graduates? After analyzing national employer survey data, interviews with advisory board, and market research results, a few themes emerged. First, the best professional have the ability to inspire others, they have strategic vision, and they have drive and integrity. Second, the best professional have strong quantitative skills, business knowledge, and technology skills. Our curriculum will teach you how to increase the effectiveness of your leadership, make strategic decisions and build a competitive advantage for the company you work for. 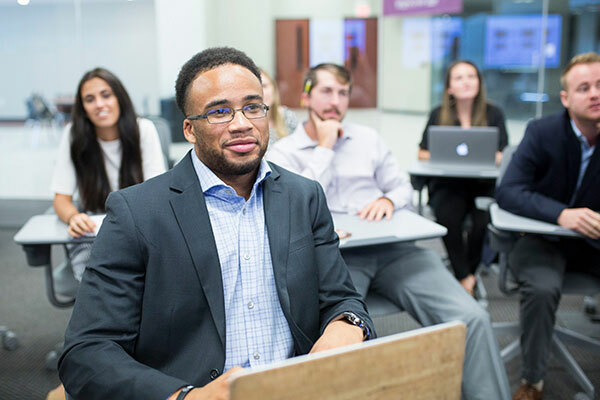 How will the knowledge and skills you expect to attain in Lipscomb's MBA program help you create more value in your organization and community? *A student is eligible for a GMAT waiver with an undergraduate GPA of 3.0 or higher and with three or more years of work experience. The Lipscomb Executive MBA includes 15 required core courses to be completed by all graduate students. For those students who do not want a specific concentration, the MBA will consist of 15 core classes and six hours of elective courses. The six hours of electives may be selected from any course in the Concentration Electives listing. Courses designated by BU/MAcc 6xxx are offered by the College of Business. The remaining elective course offerings are offered by other colleges, and specific course timing may not coincide with the MBA schedule. Students electing to take the optional international travel course are responsible for the cost of airfare and meals during the trip. Executive MBA students can apply for one of the following scholarships. A limited number are available. Each year, a few graduate assistantships are available. Assistantships require 20 hours of work per week and cover part of tuition. Graduate assistantship awards are based on need, merit, ability, and availability. Typically, assistantships are given for one-year terms, but students may apply for extensions. These assistantships are given to offset tuition charges. A 3.00 GPA must be maintained to receive an assistantship.